NARA M1003. 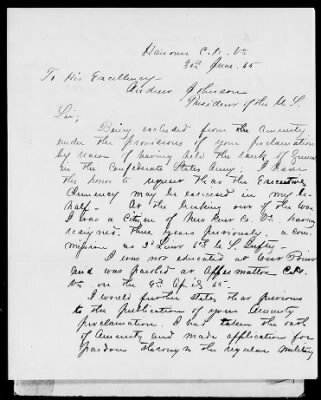 Applications for pardon submitted to President Andrew Johnson by former Confederates excluded from earlier amnesty proclamations. These case files are organized by state, then by petitioner's last name. The majority is predictably from the south, although a few northern states are represented. Applications for pardon were submitted to President Andrew Johnson by former Confederates excluded from the provisions of his amnesty proclamation of May 29, 1865, together with affidavits, oaths of allegiance, recommendations for executive clemency, and other accompanying papers. Most case files are 3-6 handwritten pages, some are longer.